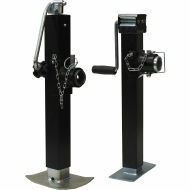 RAM offers a series of Hitch Jacks suitable for a wide range of OEM applications and equipment. Every model is designed for the strength and durability required to safely secure, load or unload machinery. Call today for off-the-shelf same day delivery!! Annual booking arrangements are also available. Draw down from stock only as you require it - save space and control inventory. Special order inquiries are welcome for custom Hitch Jack sizes, paint colors and zinc plating. 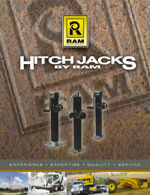 Contact RAM today for your reliable source of dependable Hitch Jacks.